Samples are stored at different temperatures in accordance to their own features. 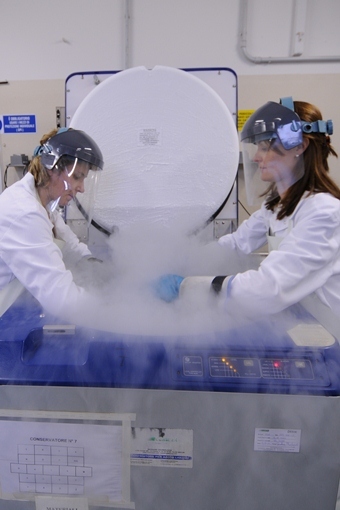 Room temperature, -20° C, -80° C, -130° C (vapour phase nitrogen), and -196° C (liquid nitrogen). Each vial is labelled using a QR barcode system. Sample management is performed by a dedicated software. It allows to know the number of available samples, their origin, laboratory of preparation / isolation and temperature of storage. Samples can be used for diagnosis, research, production, epidemiological surveys and other applications. IBVR is managed through an innovative web software application which is able to collect all the information of the biological material managed by IZSLER Biobank. This application provides software catalogue services to search and browse all of our resources.